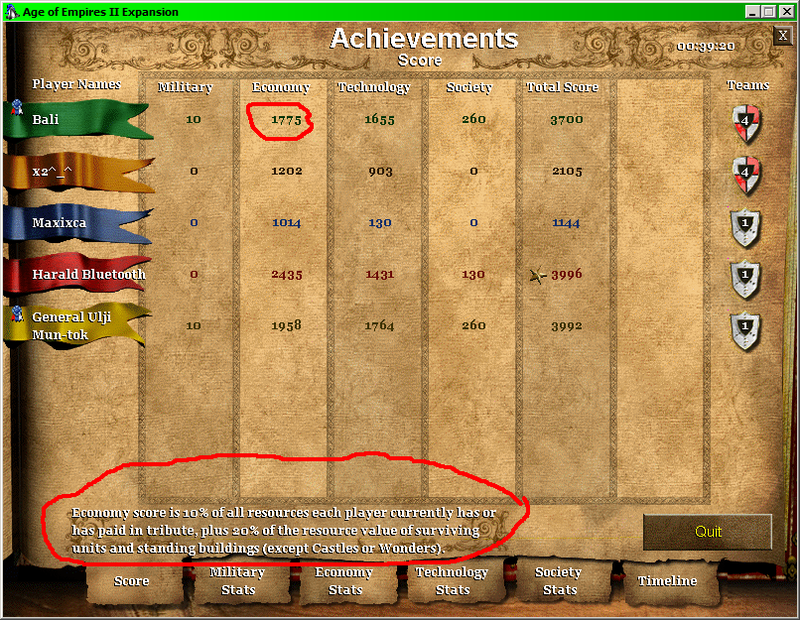 Age of Empires 2 has a score system where it gives each player a certain number of points based on all the various aspects like military, economy etc. I was wondering if anyone would have a more detailed list of exactly what gives how many points? I know that you can get by far the most points by military actions like killing enemy units but I'd like to know more. After the game, on the Achievements page, tab called "Score", hover your mouse on a score value in one of the columns, and you will see a text at the bottom that describes the score system. Military score is 20% of the resource value (cost) of all enemy units and buildings each player destroyed or converted. Economy score is 10% of all resources each player currently has or has paid in tribute, plus 20% of the resource value of surviving units and standing buildings (except Castles or Wonders). Technology score is 20% of the resource value of every technology each player has researched, plus 10 points for every 1% of the map explored. Society score is 20% of the cost of the Castles and Wonders each player has constructed. Total Score is the overall total of each player's Military, Economy, Technology, and Society scores. For example, if you have 189 points in Dark Age and do nothing else but buy a Villager for 50 food, you will temporarily lose 5 points (10% of 50), so you'll have 184 points. Once the villager is born/"built", you'll get 20% of 50, that is 10 points, for the villager, and you'll have 194 points. If you now chop 15 wood and add it to your resources then you'll get 1 extra points (that's "10%" of 15) and end up with 195 points. Side note: in Dark Age where the points are low and actions are few, score is a very valuable information about your opponent's economy, start of age-advancing and scouting. It's also possible to recognize some known strategies based on score patterns. If I remember right you can click each tab at the end of the game and see the breakdown of each category. For example 'Military' may have Units Killed, Units Lost, Buildings Destroyed. Not the answer you're looking for? Browse other questions tagged age-of-empires-2 or ask your own question. What does the in-game score in Age of Empires II mean? Age of Empires (1+2) online? What are the base Line of Sight values for units in Age of Empires 2?